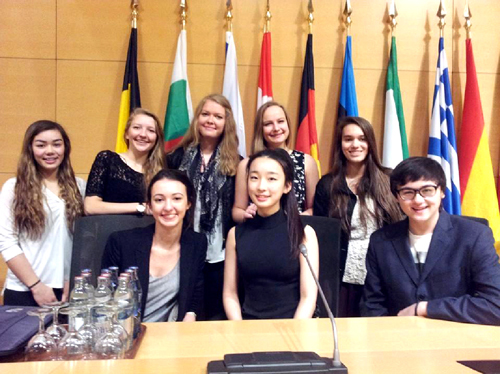 From March 20th to 22nd eight of us represented our school in the 9th annual European Global Issues Network conference held at the Chamber of Commerce here in Luxembourg. Over 30 schools from as far as New York and Dubai participated, each with their unique presentation on a global issue. We ourselves presented on two different topics, the first being ‘Does stereotyping lead to racism’ presented by Marie Laure, Yesun, Isabel (yrs 12) and Anna (yr 11), and the second being ‘what on earth is education?’ presented by Alana, Joseph (yrs 11), Sophia and Sophie (yrs 12). Over the three days we had the privilege to meet very inspiring key note speakers, such as The Grand Duchess of Luxembourg Maria Teresa, 15 year old social entrepreneur Cassandra Lin, the founder of the Virtue Foundation Joseph Salim, and Hedda Pahlson-Moller, the founder and owner of Omnisource International. Overall, this was an inspiring and enriching experience that we all greatly benefited from. Our mission now is to incorporate the valuable lessons we learnt from this experience into our school, and beyond. Lastly, we would all like to express our deepest gratitude to Ms Moody and Mrs White, who supported us throughout the long process of preparation and pushed to achieving our best.